With every expedition, the explorers who set out from Precipice unlock more of the Blackstone Fortress’ secrets. Countless riches await those who can find them – and countless dangers also. Amongst the roving squads of heretical warriors, the prowling packs of snarling predators and the eldritch defence systems of the fortress itself, a new threat has been sighted. A monstrous beast lurks in the darkness, one that is feared throughout the Imperium and beyond. It is an apex predator, an ancient terror, and a being utterly incapable of reason or mercy – a dreaded Ambull. In the first expansion to Warhammer Quest: Blackstone Fortress, The Dreaded Ambull, you’ll discover more challenges, more insight into these mysterious structures, and of course, more enemies for your intrepid adventurers to discover and take on. Along with new rules, new discovery cards and new exploration cards, this box also contains three Citadel miniatures. As well as the hulking Ambull itself, there are two Borewyrm Infestations that represent the offspring of this terrifying xenos monster. With this expansion, you’ll be able to add new dimensions of enjoyment and complexity to each of your visits to the Blackstone Fortress. – A 16-page Dreaded Ambull Booklet full of rules and background information for the expansion. – A Lair of the Beast sheet that includes board set up details, rules, an event table and victory conditions. Rules for using the Ambull and Borewyrm infestations in games of Warhammer 40,000 are also included. 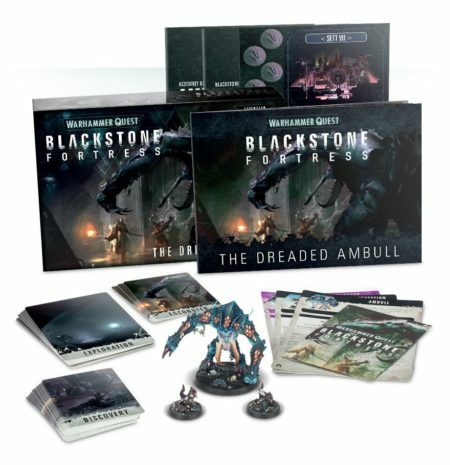 Please note: This expansion requires a copy of Warhammer Quest: Blackstone Fortress to play.